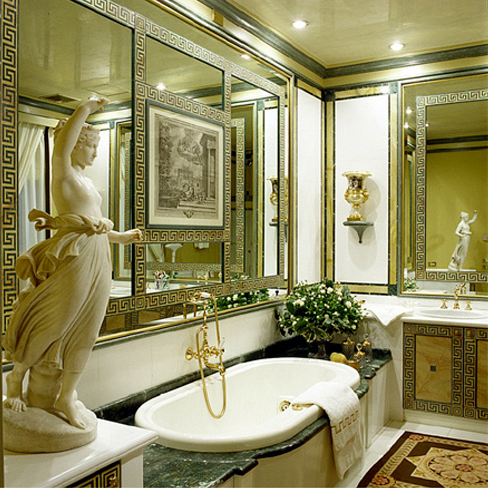 Rely on Viem for your bathroom furnishing. We will design and create the entire furnishing or even just a single piece of furniture to measure. The exclusive use of prestigious materials and their reliability gives every one of our creations superior beauty that lasts over time. This page showcases a small selection of our creations, some of which were designed in collaboration with important interior design studios. Wall furnished with a shower box and toilet box. 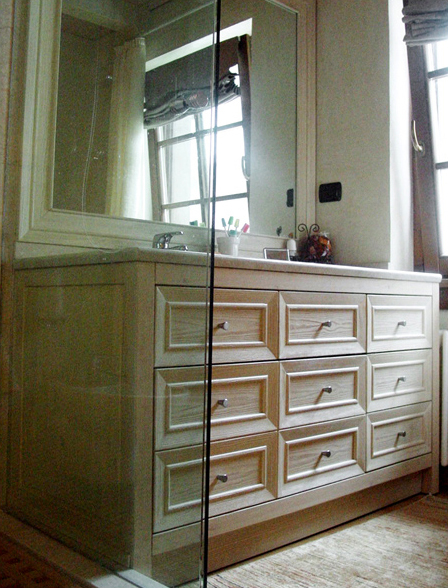 Bathtub with lacquered front covering. Wall panel with glass decoration insertion. 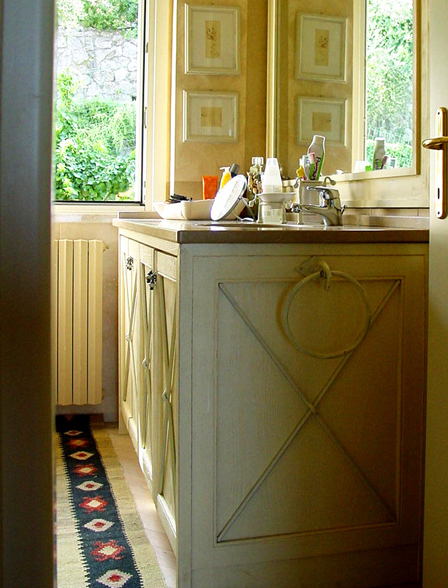 Lacquered door bathroom furniture with hand painted decoration. The bathtub has a shaped lacquered front panel. 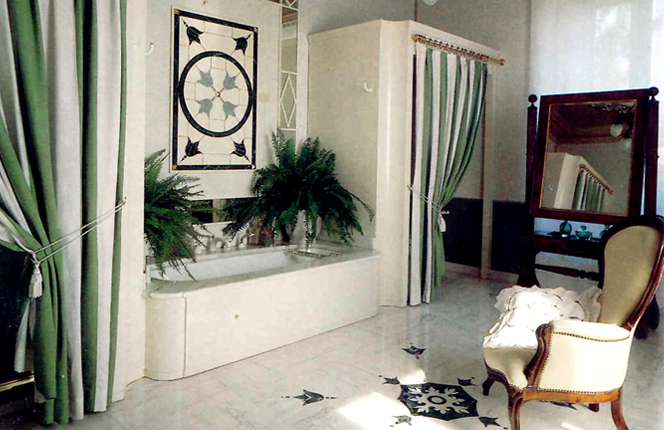 The walls are covered with hand painted panels with shaped mirror insertion. Ivory lacquer pickled oak bathroom furniture, all with drawers and chest drawers. Countertop in antiqued Biancone of Vicenza marble. Double depth bathroom furniture with rounded door edges a series of grooved pilasters. 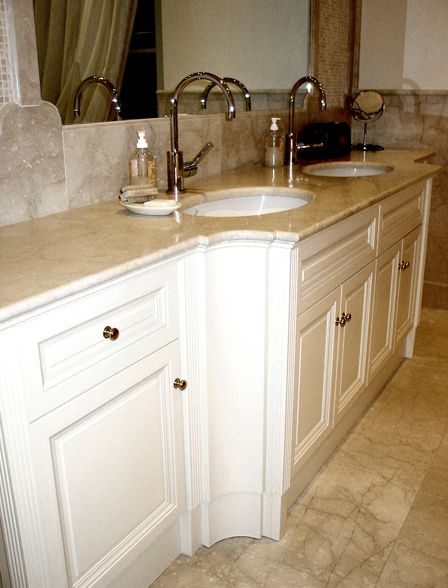 Botticino marble countertop with undermounted sink. Ivory pickled oak bathroom furniture. Edged doors with ivory lacquered iron tubing. Antiqued and bushhammered Trani marble countertop. 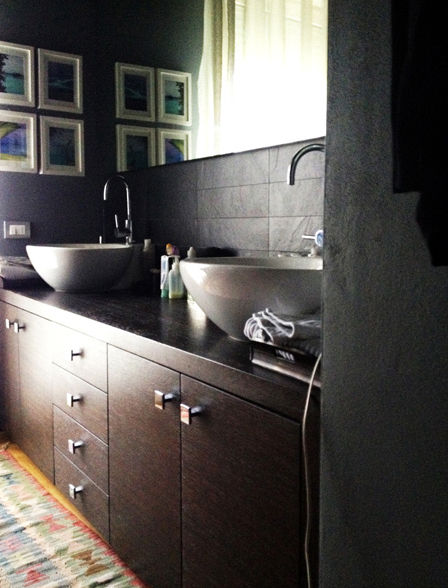 Double depth brush lacquered bathroom furniture, edged doors, and concave pilasters. Shiny Rosa Perlino marble countertops with bullnose finishing. 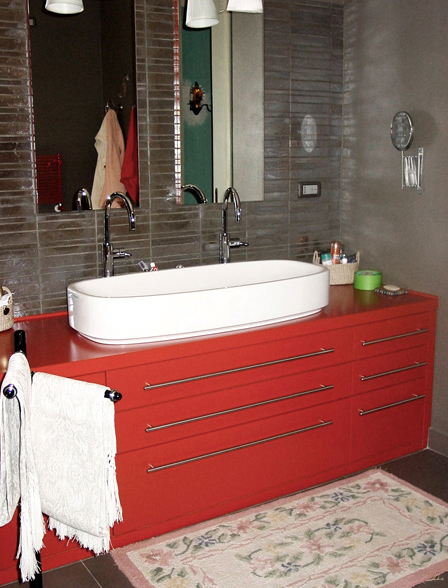 Shiny red lacquered bathroom furniture with drawers and chest drawers. 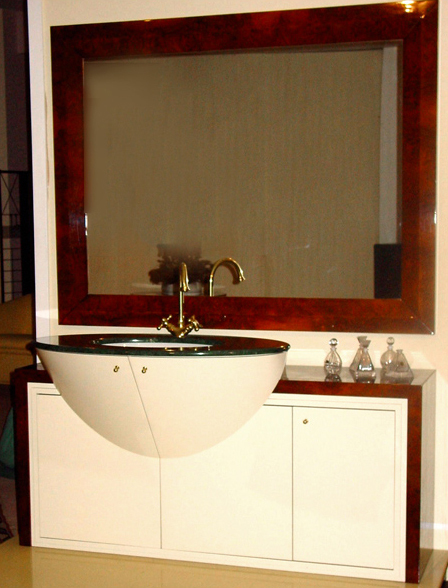 Double flat lying sink and rectangular mirrors. 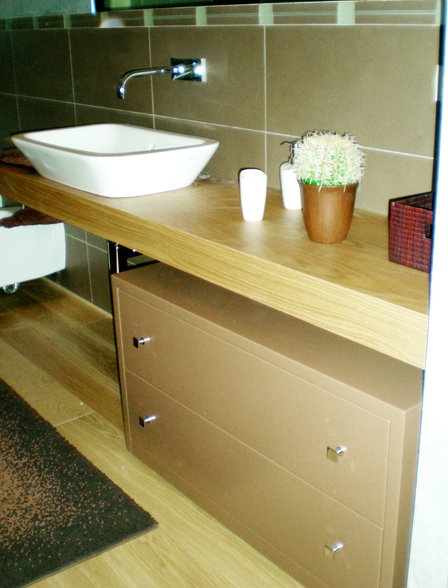 Grey lacquered integral bathroom furniture. 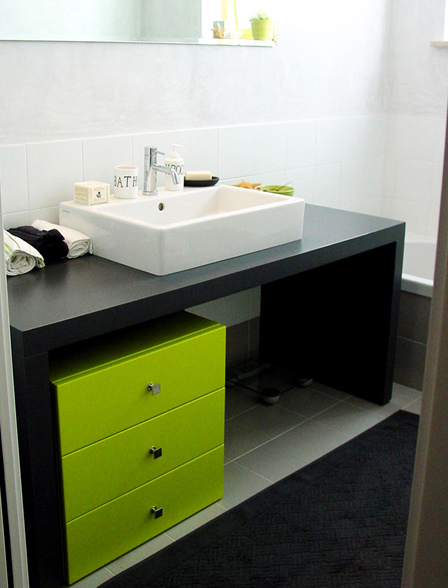 Detached drawers on wheels, lacquered acid green. Wengé oak bathroom furniture with countertop and 5 cm side pilasters. Honey oak large shelf 10 cm high. 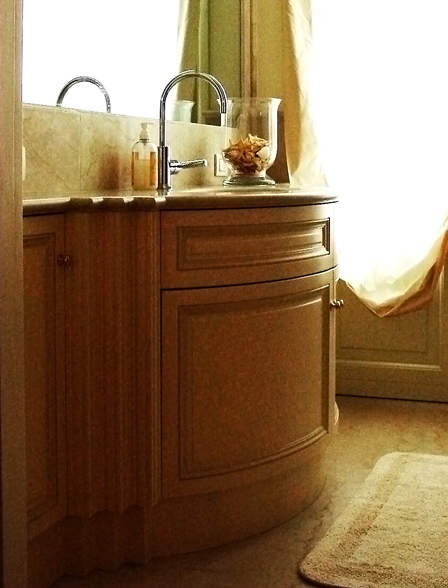 Briarwood integral bathroom furniture and ivory lacquered doors, with round shaped under sink structure.